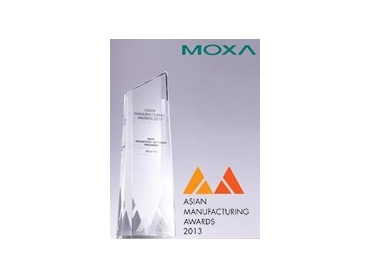 Leading global industrial automation solutions provider Moxa Inc. was named ‘Best industrial network provider’ at the Asian Manufacturing Awards 2013. The award is in recognition of Moxa's comprehensive industrial network solutions and outstanding services for industrial applications such as factory automation, oil and gas, railway, intelligent transportation systems, and recent power industry projects in Asia. According to the judging panel, industrial networks provide the critical connection of control systems to shop floor equipment as well as integration to higher level systems, and their adoption continues to increase in Asia's manufacturing industries. Industrial Ethernet-based networks are becoming ever more prevalent with continuing development of standards and advances in technology. The panel added that Moxa’s industrial Ethernet product range includes switches, routers, gateways, media converters and network management software, and it has achieved considerable success through power industry projects in Indonesia and Thailand over the last year. Moxa's solution teams enjoy close collaborations with customers, channel partners, and solution partners to achieve and share success in various industrial fields. With over 500 products, Moxa’s industrial Ethernet solutions range is a one-stop shop to fulfil the requirements of many industrial sectors. With a global network of professional staff and partners, Moxa provides advanced industrial network solutions with customer-centric services for various manufacturing industries. The Asian Manufacturing Awards (AMA) is held annually to recognise industry leaders with excellent manufacturing-related products, solutions and services.